The human and economic costs of extreme weather events in just the last two years is staggering, including a profound loss of life. Globally, weather disasters cost the world more than $155 billion in 2018 . The United States was hit particularly hard, including Hurricanes Michael and Florence and the catastrophic wildfires that tore through California. 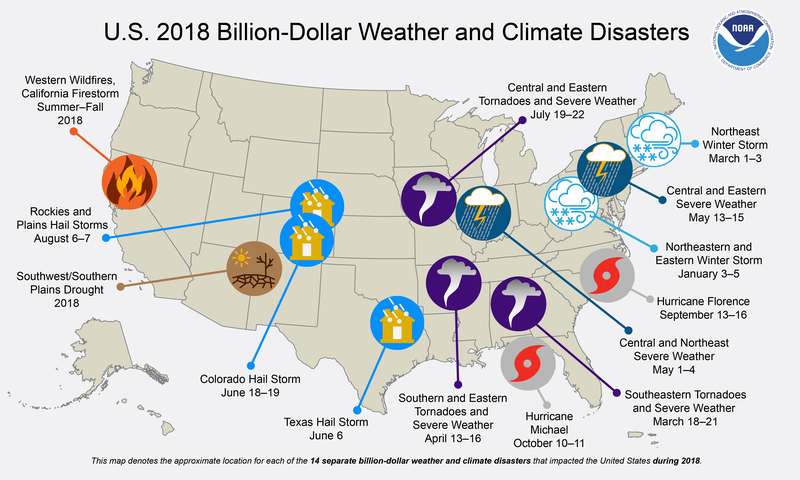 As catastrophic as 2018 was for extreme weather, 2017 was far worse, costing over $300 billion in the United States alone . Hundreds of news stories each week highlight the risks and vulnerabilities that communities, regions, and nations are facing worldwide due to the changing climate. There are seemingly daily headlines blasting what increasingly feels like the “new abnormal,” including the current polar vortex in the Midwest and Northeast . Two landmark reports released in late 2018 underscored the fact that the tipping point for the global environment is now. The Intergovernmental Panel on Climate Change (IPCC) released a special report titled Global Warming of 1.5° Celsius that confirmed the pace and intensity of the Earth’s changing climate system was stronger than previously understood . The second volume of the Fourth National Climate Assessment emphasizes the consequent impacts and risks of climate change and potential adaptations . The Assessment goes on to outline some of the measures necessary to help communities reduce their vulnerabilities—innovations like forward-looking infrastructure design and longer-term planning, informed by resilience guidelines, that can help communities prepare now to cope with the effects over the next decades. The integration of climate risk into decision-making and the implementation of adaptation activities have significantly increased since the Third National Climate Assessment in 2014, including in areas of financial risk reporting, capital investment planning, development of engineering standards, defense planning, and disaster risk management . The simple conclusion from both the IPCC and NCA4 reports is that to avoid worldwide disaster, the time for strong action and smart policies to reduce the pace and intensity of climate change is now. Media coverage of climate science and the impacts of extreme weather can generate a tenor of fear that leaves many seeking solutions and hope. Turning towards current and useful scientific research helps us navigate the endless stream of news. The strongest asset decision-makers have is science and the research, data, and tools it provides. It is imperative that decision-makers at all levels of government move to action using science to inform their work. In the seemingly dire state of the world, there are accessible solutions—key to their success is the political will by leaders to commit, get scrappy, and to implement them. As Paul Hawken , the celebrated editor of Drawdown: The Most Comprehensive Plan Ever Proposed to Reverse Global Warming, suggests, “The first rule of sustainability is to align with natural forces, or at least not try to defy them.” Whether or not today’s infrastructure can be aligned with natural forces based on the current pace of change will determine if the path forward is sustainable. According to Hawken, the technologies and solutions to effectively solve global warming already exist. Science can help further challenge the notion that infrastructure must come at the expense of natural resources. Resilience offers an intersectoral, interdependent strategy that considers economic opportunities, security and stability, and cultural growth. New Scientist recently published an article outlining the expansion of roads around the globe, with nine-tenths of all new infrastructure planned for developing nations; it is projected that an additional 25 million kilometers of roads will be built worldwide by 2050 . Yet the article also spotlights leaders embracing the challenge of growing sustainably. In Nigeria, a state government agreed to reroute a major highway in order to avoid disrupting the gorilla population at a national park. In Bangladesh, a state-owned rail company is building overpasses designed to permit wild elephants to cross a high-speed line under construction. Subnational governments have become the laboratories where innovation and invention are not only used but relied upon. Scientist Steven Pinker argues in his book Enlightenment Now: The Case for Reason, Science, Humanism, and Progress that while it is not yet at the scale needed, there is progress being made towards bending the curve of carbon emissions downward, as we reduce the carbon intensity of the global economy . This is not to suggest that the problem of climate change has been solved or that our current path leads to a sustainable future. However, there must be a place between the sixth extinction and a Pollyannaish naivete. Science serves as the bridge between the two extremes. It is a resource that continually evolves to serve decision-making and inform smart policy. The UN Sustainable Development Goals offer an incredible example of what happens when science and policy meet . Today, science is better poised to serve as an essential element to environmental decision-making than ever before. The newest cohort of elected leaders in the United States marks a notable moment in Congressional history and national leadership. A record number of candidates with science credentials were just elected to Congress—including a former ocean engineer and a former high school chemistry teacher—following a historic number of scientific professionals and engineers running for office for the first time. Not every scientist should run for office, nor should every office be held by a scientist; however, it is an obligation to ensure that science is represented at the table at which decisions are made. In the recently published book This is the Way the World Ends, author Jeff Nesbit reflects on previous challenges the world has faced—from creating civilization in the shadow of the last ice age to the Industrial Revolution—and asserts that we can get out of this box canyon by understanding the realities and changing the worn-out climate conversation to one that is relevant to every person by using science and political will to execute the changes needed at both the policy and deployment levels. Science serves the public good and can lead society toward solutions, not merely raise alarm to frame crises. Science brings substance to policy deliberations through evidence-based research and analysis. Science serves as the foundation to the solutions in Drawdown and beyond. Science offers hope and continually informs the art of the possible. Recalling Archimedes two thousand years ago, if we have a lever and a place to stand, we can move the world. Science is a lever. Today’s acute global challenges require that decision-makers and scientists turn toward each other to empower science to serve to its fullest potential. The NCA4 Volume II is the result of a collaborative effort across 13 federal agencies, engaging a range of technical experts and extensive public comment opportunities. Using detailed climate models, often at scale as small as four miles, tied to a range of economic and social indicators, the report illuminates climate change consequences for 16 topics of national interest, 10 U.S. geographic regions, and 2 chapters on response strategies (mitigation and adaptation); https://nca2018.globalchange.gov/.